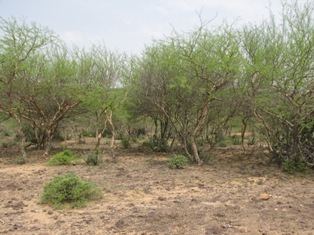 These forests represent a degradation stage of Dry Deciduous Forests which are formed as a result of adverse biotic factors such as overgrazing, lopping, felling and fires. The main tree species found in scrub forests are Aegle marmelos, Lannea coromandelica, Sapium insigne, Erythrina suberosa, Cassia fistula, Flacoutia indica, Zizyphus mauritiana, Z. xylopyra, etc. The common shrubs are Nyctanthes arbor-tristis, Woodfordia fruticosa, Lantana camara, Carissa opaca, Xeromphis spinosa, Murraya koenigii, Colebrookia oppsitifolia, Adhatoda zeylanica, Zizyphus oenaplia, etc.